The Habits of Trout is a collection of essays about fishing for the things in life that are hard to catch, hard to hold, and—ultimately—hard to let to. Trout, Tim Schulz reminds us in this book, are but one of those things. Through his clear-headed, big-hearted, smart, funny, honest and fresh stories, Schulz shows us that in life in general—and trout fishing in particular—we sometimes need to be grounded by the humility of failure so we can be lifted by the hope of success. 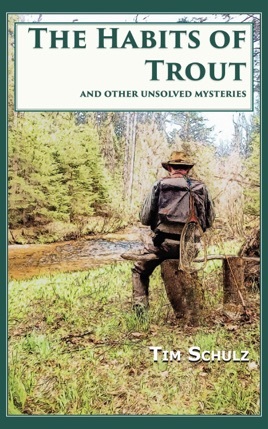 Beginning with a quest to explore the rugged backwoods environs were John Voelker found an abundance of wild trout and a dearth of crowds, Tim Schulz shares his love of family, friends, wild trout and bamboo rods in a collection of essays and yarns set in Michigan’s wild Upper Peninsula. With a tinge of self-deprecating humor and wit, Schulz shows how fishing can help you grow older without growing up, and scattered throughout his stories are some lessons that just might make you a better fisherman which, in turn, might help you catch the biggest brook trout of your life . . . twice.